Medical Liability Alliance (MLA) is a wholly owned subsidiary of Missouri Hospital Plan (MHP) that provides professional and general liability insurance to hospitals, physicians, allied healthcare providers and other healthcare facilities in Missouri, Kansas and Illinois. At the request of the MHP Board, MLA was called upon to address the problem brought on by the malpractice crisis of 2002 by making reasonably priced, financially secure, insurance coverage available to physicians practicing at our hospitals. Today, MLA has expanded its services beyond its original physician-only base while gaining a reputation for providing reasonably priced insurance with exceptional value added services to a variety of healthcare policyholders. MLA is the only company, of the top ten companies serving the medical malpractice sector, which has maintained its market share, while lowering rates, and improving its equity position in a “soft market”. 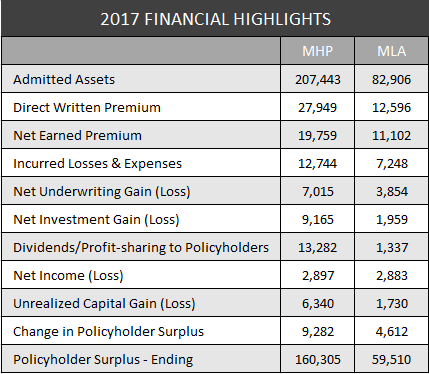 In 2009, MLA developed a unique profit sharing arrangement to return profits to its Quality Caregivers that has increased every year since its inception and is unmatched by any competitors. Through its wholly-owned licensed agency/broker, ProCon, MLA offers healthcare providers access to competitively priced, financially secure insurance. For healthcare providers or insurance brokers looking to partner with Medical Liability Alliance, please contact Melissa Heaton or Tyge Fourtner at Providers Insurance Consultants, (800-522-2776). WHAT PROGRAMS/FEATURES DOES MLA OFFER?